This post is sponsored by Conscious Discipline®, all opinions expressed are my own. Are you done with the tantrums, tears and meltdowns? The Feeling Buddies© for Families Toolkit gives your kids healthy self regulation skills with the power to change everything. Let me share with you how it’s changing the way we do things in our home. The house seems a lot quieter these days now that both of my girls are in elementary school. One child is in 5th grade and the other is in Kindergarten and both are quite excited they are in the same school together this year. You would think that they would miss each other all day long as much as I have missed them and would spend hours playing sweetly together after school but somehow our afternoons together are not quite as magical as I had hoped they’d be. They both come home and soon after some very big emotions arrive throughout the afternoon and evening. Does this happen with your child too? Do you have a child who acts differently around others than they are around you as a parent? A simple task becomes overwhelming for them at times at home. Are they hungry. Are they sleepy? Are you sad or angry or anxious? I find myself trying to figure out what’s wrong more often than I’d like to admit as I’m trying to help this big ball of emotions before me in my child. Their teachers would never guess how they act sometimes, trust me I’ve asked in our parent conferences. I’ve tried to figure out how they can be so different at school where they are calm, sweet, kind, hardworking and thoughtful and then once they arrive home their emotions are quite different. Some afternoons are filled with tears, yelling and frustration. Frankly I think it’s from holding in their emotions in all day long and once they’re home they feel more at comfort and their self regulation gets a bit more relaxed and uncontrolled. A parental flag that I need to be working with them more on managing healthy responses to emotional upset. I’ve found a parenting tool that will help you both out with your feelings as you help them learn the skill of self regulation. 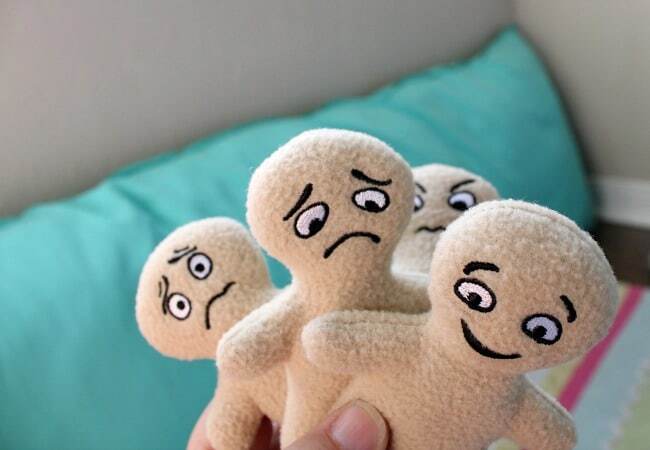 It’s called Feeling Buddies for Families. I’ve shared tips for raising a strong willed child and many of the tips actually come from my own experience while I earned my Early Childhood Education Degree. 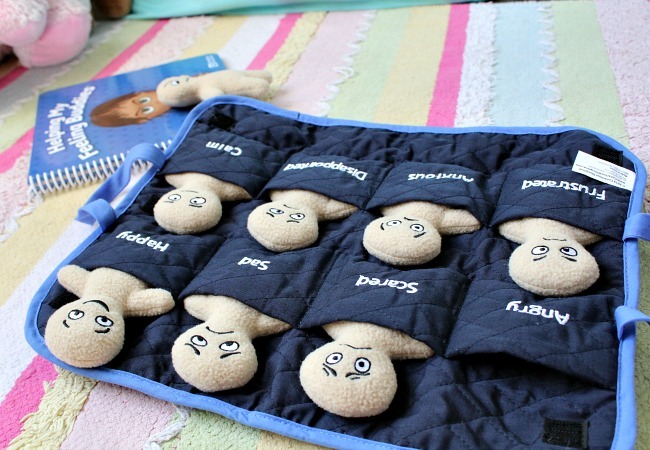 I was thrilled to be asked by my former college professor, Dr. Becky Bailey, to share with you a new kit she’s developed for parents called The Feeling Buddies for Families Toolkit from Conscious Discipline®. 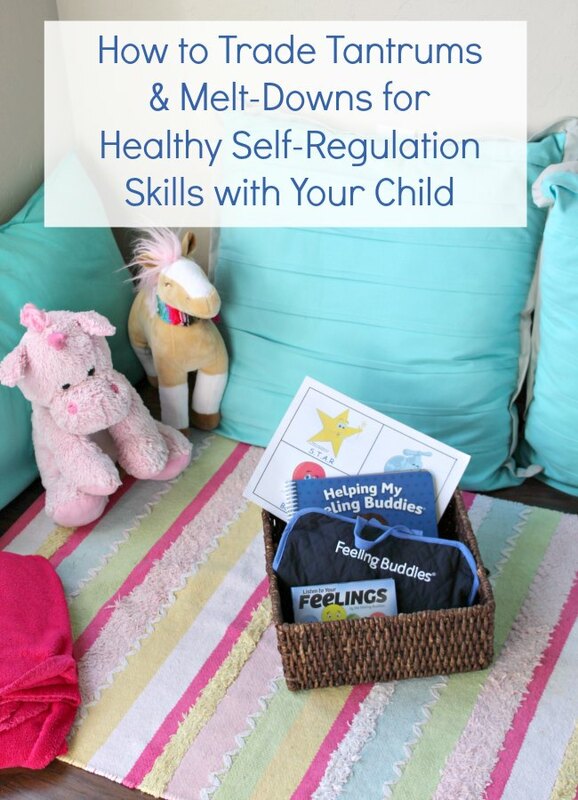 The toolkit is inspired by Dr. Becky Bailey’s best-selling self-regulation curriculum. Since we’ve started implementing the toolkit, it’s been helping us with our afternoons of big emotions as both my girls and even myself are working on our self regulation. It’s beginning to transform our home as our family trades tears, tantrums and melt-downs for healthy self-regulation skills and a positive inner voice. For some reason in my classroom these concepts of self regulation and emotional intelligence were so much easier to teach to Kindergartners than at home with my own children. 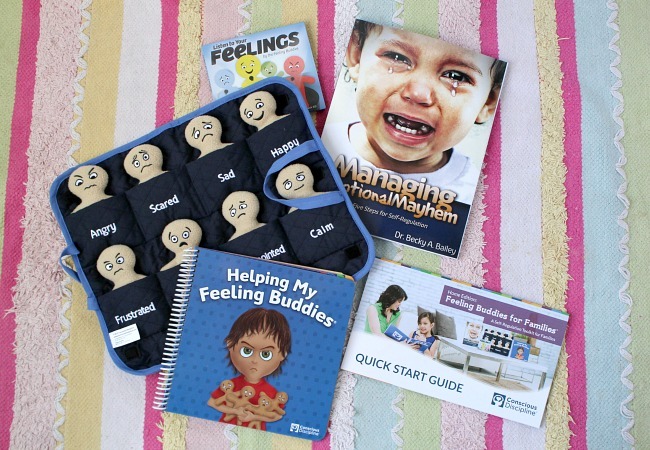 We needed something that helped us talked about the topic of emotions in a more focused way and The Feeling Buddies for Families Toolkit does just that. The free printables for the Four breathing techniques were always on my wall in my classroom and now we’ve added them to a special spot in our home called a Safe Place. Now they are always there to remind us of how to take deep belly breaths as we approach situations and others who may be stressed too. Becky and her team created a Step by Step Quick Start Guide that made implementing her new program so easy to follow. I love that the Feeling Buddies for Families Toolkit included 7 videos to watch and even a few to answer questions that may come up along the way. There’s even a few more free tools within the videos to help you and your child. My favorite video is the last one where Becky explains how to use your safe buddies and how no matter what age we all need a reminders. She shares with us that we’re all human and conflict is an important part of life and we can use it to learn new skills to bring connections. 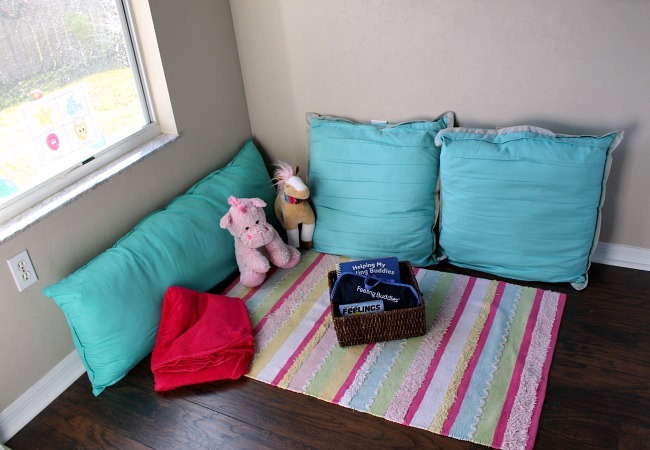 This past month we set up our Safe Place together in our home, which is described in her book Managing Emotional Mayham and I noticed over the holidays they kids were becoming more comfortable with using it and they went there to work on their deep breathing and using their feeling buddies to express their feelings to help them solve some conflicts. 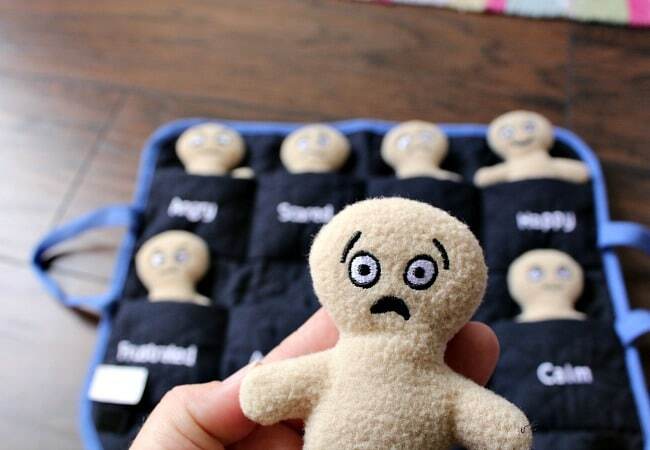 With my parents visiting and more people around than normal I’ll admit I was using the Feeling Buddies language and strategies she teaches a bit more to help calm myself down as well. Truthfully much of what it teaches helps parents rewrite some of the inner speech that we’ve learned over the years that might not be as helpful as we’d need it to be. I’ll be rereading her book Managing Emotional Mayham a few more times the next few months as I work on this goal and life long practice to get our family on this path of healthy emotional control and self regulation. Plus I’m asking my spouse to read this one with me, I think it will help us both to be on the same page as we raise our little girls together. We’re learning very quickly that girls can be a little different that a boy when it comes to this area now that our son has grown up. I am so glad that we’ve added Feeling Buddies to our tool belt for our family. Will you join me? 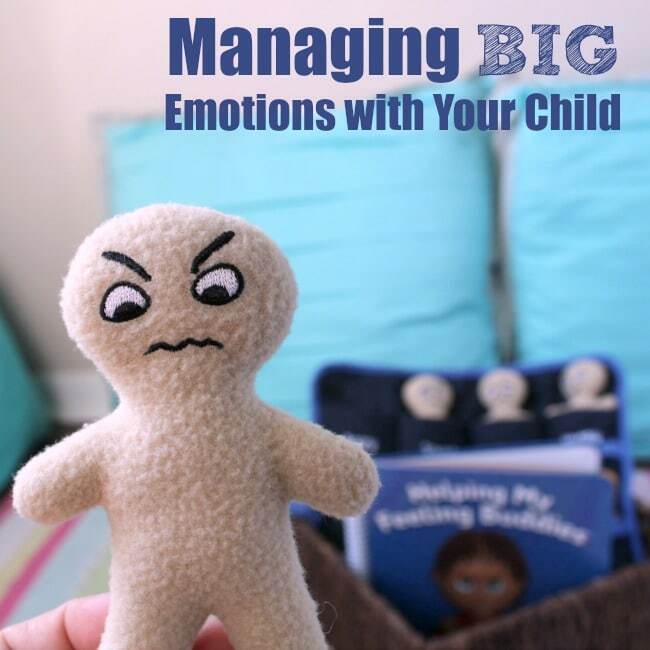 Somedays parenting makes me anxious just like this feeling buddy and one of the most important messages from the Feeling Buddies for Families resources is the message of…. You’re safe, You’re calm and you can handle this. Are you with me? Let’s start today and make a change for you and your child through using the Feeling Buddies for Families Toolkit. What a super cool idea! I just saw the photo and was instantly like, “I gotta have these! !” I hope I can get them here in Europe. Thanks for sharing!